Jonathan Swift was born on November 30, 1667 in Dublin, Ireland, the son of Protestant Anglo-Irish parents: his ancestors had been Royalists, and all his life he would be a High-Churchman. His father, also Jonathan, died a few months before he was born, upon which his mother, Abigail, returned to England, leaving her son behind, in the care of relatives. In 1673, at the age of six, Swift began his education at Kilkenny Grammar School, which was, at the time, the best in Ireland. Between 1682 and 1686 he attended, and graduated from, Trinity College in Dublin, though he was not, apparently, an exemplary student. In 1688 William of Orange invaded England, initiating the Glorious Revolution: with Dublin in political turmoil, Trinity College was closed, and an ambitious Swift took the opportunity to go to England, where he hoped to gain preferment in the Anglican Church. In England, in 1689, he became secretary to Sir William Temple, a diplomat and man of letters, at Moor Park in Surrey. There Swift read extensively in his patron's library, and met Esther Johnson, who would become his "Stella," and it was there, too, that he began to suffer from Meniere's Disease, a disturbance of the inner ear which produces nausea and vertigo, and which was little understood in Swift's day. In 1690, at the advice of his doctors, Swift returned to Ireland, but the following year he was back with Temple in England. He visited Oxford in 1691: in 1692, with Temple's assistance, he received an M. A. degree from that University, and published his first poem: on reading it, John Dryden, a distant relation, is said to have remarked "Cousin Swift, you will never be a poet." In 1694, still anxious to advance himself within the Church of England, he left Temple's household and returned to Ireland to take holy orders. In 1695 he was ordained as a priest in the Church of Ireland, the Irish branch of the Anglican Church, and the following year he returned to Temple and Moor Park. 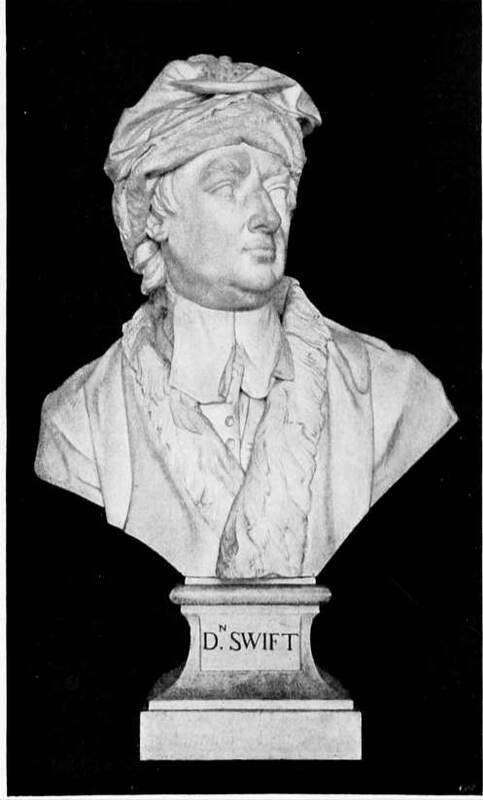 Between 1696 and 1699 Swift composed most of his first great work, A Tale of a Tub, a prose satire on the religious extremes represented by Roman Catholicism and Calvinism, and in 1697 he wrote The Battle of the Books, a satire defending Temple's conservative but beseiged position in the contemporary literary controversy as to whether the works of the "Ancients" — the great authors of classical antiquity — were to be preferred to those of the "Moderns." In 1699 Temple died, and Swift traveled to Ireland as chaplain and secretary to the Earl of Berkeley. In 1700 he was instituted Vicar of Laracor — provided, that is, with what was known as a "Living" — and given a prebend in St. Patrick's Cathedral, Dublin. These appointments were a bitter disappointment for a man who had longed to remain in England. In 1701 Swift was awarded a D. D. from Dublin University, and published his first political pamphlet, supporting the Whigs against the Tories. 1704 saw the anonymous publication of A Tale of a Tub, The Battle of the Books, and The Mechanical Operation of the Spirit. In 1707 Swift was sent to London as emissary of Irish clergy seeking remission of tax on Irish clerical incomes. His requests were rejected, however, by the Whig government and by Queen Anne, who suspected him of being irreligious. While in London he he met Esther Vanhomrigh, who would become his "Vanessa." During the next few years he went back and forth between Ireland and England, where he was involved — largely as an observer rather than a participant — in the highest English political circles. In 1708 Swift met Addison and Steele, and published his Bickerstaff Papers, satirical attacks upon an astrologer, John Partridge, and a series of ironical pamphlets on church questions, including An Argument Against Abolishing Christianity. In 1710, which saw the publication of "A Description of a City Shower," Swift, disgusted with their alliance with the Dissenters, fell out with Whigs, allied himself with the Tories, and became the editor of the Tory newspaper The Examiner. Between 1710 and 1713 he also wrote the famous series of letters to Esther Johnson which would eventually be published as The Journal to Stella. In 1713 Swift was installed as Dean of St. Patrick's Cathedral in Dublin — a promotion which was, again, a disappointment. The Scriblerus Club, whose members included Swift, Pope, Congreve, Gay, and Arbuthnot, was founded in 1714. In the same year, much more unhappily for Swift, Queen Anne died, and George I took the throne. With his accession the Tories fell from power, and Swift's hopes for preferment in England came to an end: he returned to Ireland "to die," as he says, "like a poisoned rat in a hole." In 1716 Swift may or may not have married Esther Johnson. A period of literary silence and personal depression ensued, but beginning in 1718, he broke the silence, and began to publish a series of powerful tracts on Irish problems. In 1720 he began work upon Gulliver's Travels, intended, as he says in a letter to Pope, "to vex the world, not to divert it." 1724-25 saw the publication of The Drapier Letters, which gained Swift enormous popularity in Ireland, and the completion of Gulliver's Travels. The progressive darkness of the latter work is an indication of the extent to which his misanthropic tendencies became more and more markedly manifest, had taken greater and greater hold upon his mind. In 1726 he visited England once again, and stayed with Pope at Twickenham: in the same year Gulliver's Travels was published. Swift's final trip to England took place in 1727. Between 1727 and 1736 publication of five volumes of Swift-Pope Miscellanies. "Stella" died in 1728. In the following year A Modest Proposal was published. 1731 saw the publication of Swift's ghastly "A Beautiful Young Nymph Going to Bed." By 1735, when a collected edition of his Works was published in Dublin, his Meniere's Disease became more acute, resulting in periods of dizziness and nausea: at the same time, prematurely, his memory was beginning to deteriorate. During 1738 he slipped gradually into senility, and finally suffered a paralytic stroke: in 1742 guardians were officially appointed to care for his affairs.